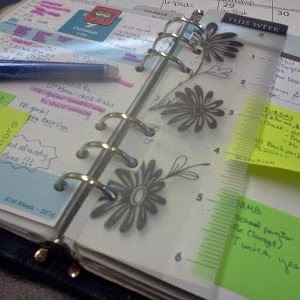 Like most plannerds, I occasionally use a post-it or sticky note in my planner. Most notably, I use a sticky with my daily chores (such as laundry, dishes, 15 minutes of cleaning, and a sweep of the house for items out of place) to move from day to day on my daily pages. But if I write something that will SURELY move, I also use a sticky. For example, my list of things that I need my husband to take care of (in pic - green sticky, lower right hand corner, that starts @AMB) moves, because he rarely gets everything done within the week. Still, I need a list to follow-up (and note each time I send an e-mail or Facebook message to him about the tasks, so when he claims that I never told him, I can go "BOOYAH!" and avoid a fight win the fight). I also have a list of what to pack for a day trip on Saturday. That list will move and stick to the backpack that I plan to pack in on Friday night or Saturday morning. 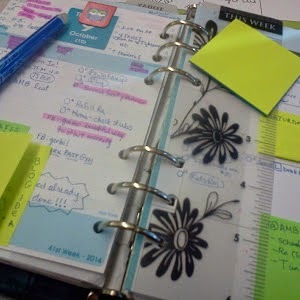 The problem, as all true plannerds know, is that the sticky note covers a lot of the page. A folded sticky folded so that I can still see the topic (as in the "blog idea" note in the lower left hand corner of the above pic) and know what is inside, but blocking MUCH LESS of the page. I never thought of that. Great idea.